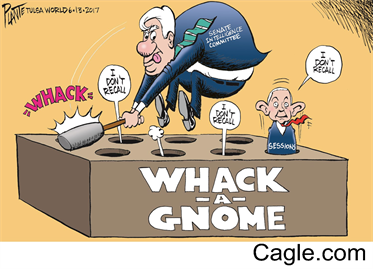 Attorney General Jeff Session's testimony before the Senate committee investigating the Russian hack attack was a tour de force of evasion. As political theater it was predictable and therefore boring. Washington kabuki has gone out of style as entertainment in 'Merica. The latest significant development in the latest political scandal to wrack the country is that the Trumpster is officially under investigation by Special Counsel Mueller for obstruction of justice. How could he not be and Washington still maintain its veil of "plausible deniability"*? Trump has all but admitted he attempted to block former FBI Director Comey's investigation of his Russian Connection by firing him. Trump has broken a record of sorts: he has exceeded both Bill Clinton, and the master of deceit, Richard Nixon, in the least amount of time in office before being investigated for possible impeachable offenses. More dirt will come. Kudos, Donald, your shady business deals have saved the Republic! *Officially enshrined as national policy of the warfare state in National Security Council Directive 10/2 issued June, 1948. President Eisenhower still said it best at the end of his tenure, though he did nothing about the problem, "In the counsels of government , we must guard against the acquisition of unwarranted influence, whether sought or unsought, by the military-industrial complex. The potential for the disastrous rise of misplaced power exists and will persist. We must never let the wight of this combination endanger our liberties or democratic processes." US Person would only add that the eloquent warning issued by the Commander-in-Chief in 1961 is now a disastrous reality, and is attributable to what is more accurately labeled the military-corporate-financial complex.